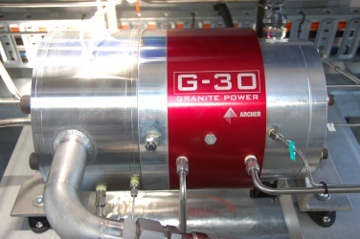 Granite Power is a geothermal company that has developed GRANEX®, a patented direct supercritical fluid heat transfer technology for the efficient, economic, and zero carbon emission generation of electricity from low grade geothermal sources using the Organic Rankine Cycle (ORC). This technology is typically used with recovered waste heat (RWH), solar-thermal sources, conventional geothermal sources, and engineered geothermal systems to generate electricity. 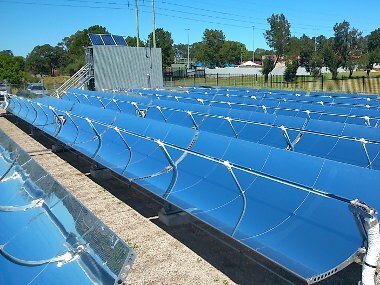 The construction of a pilot plant to demonstrate the use of the GRANEX technology with a solar parabolic trough linear concentrated receiver system was partially funded through a grant from the Australian Renewable Energy Agency (ARENA). Rated at 150 kW thermal, the receiver system consists of six 1,800 mm by 35 m parabolic concentrating troughs. The GRANEX fluid is heated by pumping it directly through the troughs, and without changing states is passed to a turbo generator. Designed in conjunction with the University of Newcastle, this generator spins at speeds of up to 70,000 RPM to produce 30 kW of electrical power for the power grid. Waste heat is passed through a heat exchanger to heat the water for a local swimming pool, allowing it to stay open for more of the year. During peak solar periods, energy can also be transferred to an insulated oil-filled thermal storage vessel. The energy stored there is sufficient to keep generating power for up to 90 minutes during periods of no sun or after sunset. 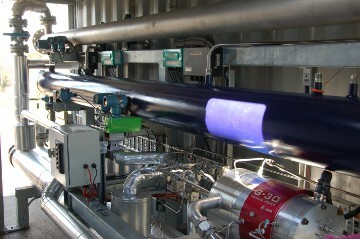 Given that this pilot plant operates at high temperatures and pressure levels, and is located next to a school and a public swimming pool, it was essential to have a control system that would be able to safely control the process while allowing researchers to change the configuration and test conditions without having to stop the process. An added requirement was for the researchers to have local and remote access to all process data. To meet these needs, Granite Power turned to a Yokogawa FAST/TOOLS supervisory control and data acquisition (SCADA) solution. Its functions include a data historian that allows the development team to compare results from the entire testing period and evaluate modifications that will guarantee future users the highest possible ROI by maximizing the efficiency of this process. A Yokogawa HXS10 solar tracking controller was utilized to keep the solar array aligned with the sun and to monitor environmental parameters, and a single Yokogawa STARDOM controller was used for the overall control of both the solar array and all key system equipment such as the turbo expander/generator. Granite Power also uses a collaboration center that incorporates live video feeds to demonstrate this system to other researchers around the world. The two members of the Granite Power development team, Sean McCracken and Matt Patterson, had limited funds and were looking for partners who could assist with hardware and had the expertise and willingness to work with them during the engineering phase to address a number of unknown variables. In selecting Yokogawa, Granite Power gained a partner that had the local engineering expertise needed to understand the challenges and was able to supply a flexible, cost effective, and workable control solution. The development team worked very closely with the Yokogawa engineering team, drawing on the core competencies of both companies to develop solutions for the unexpected challenges that were encountered during the project. The Yokogawa engineers developed an interface between the solar power system and this facility's turbo generator and BOP facilities. Yokogawa's power station engineering experts also worked to optimize the operations of the custom-designed turbo generator. The use of a single STARDOM controller for the integrated control of the solar field, balance of plant (BOP) facilities, and turbo generator enabled significant savings in both space and cost. The FAST/TOOLS SCADA provided an all-in-one monitoring, alarm, data historian, trending, and reporting solution, and enabled easy remote access for offsite use. The FAST/TOOLS software could be installed on the notebook PCs used by the development team, eliminating the need for costly dedicated servers. As an added benefit, this enhanced security by making it possible to remove all proprietary information from the site. With its advanced capabilities, the integrated Yokogawa control solution provides an ideal and highly flexible solution that can easily be customized as the plant evolves. Sean McCracken, project manager, said, "The FAST/TOOLS STARDOM solution was perfect for our plant with plenty of growth potential. Although we only a demonstration plant, the control is as complicated as a large plant with the added challenge of managing a boiler that is effectively turned off and on by the passing of clouds. The development of the control and management of the plant was streamlined with FAST/TOOLS helps analyse our data and quantify the performance of the novel power plant. Matt Patterson, project engineer said "The combination of the STARDOM Controller and FAST/TOOLS has proved powerful and flexible for our requirements. Even for novices like us, we easily configured Fast/Tools for our monitoring, alarm, data historian and trending. The STARDOM controller has had more than enough capacity for us to automate our plant, which as a solar thermal power plant starts and stops at least once per day with many off design control requirements. The Yokogawa solution has allowed us to complete our research within tough budget and time constraints and has left a legacy that will be the back bone of further research and commercial ventures in coming years. 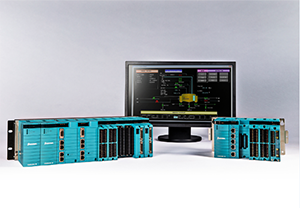 The HXS10 combines the best of Yokogawa's measurement and control technologies. The measurement system is inherited from Yokogawa's recorders that are used in mission critical applications throughout the world; while the control engine comes from Yokogawa's highly reliable loop controllers that have been proven and refined for over 30 years.